Make vinaigrette – Put olive oil, red wine vinegar, lime juice, jalapeno peppers, garlic, Dijon mustard, honey, black pepper, cumin, and sea salt into a blender, puree until smooth. Stir in cilantro, taste and adjust seasoning as necessary. If not using right away, shake before serving. 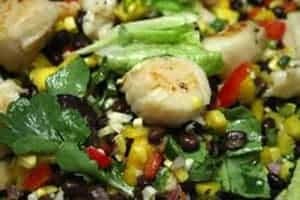 Combine the black beans, mango, red onion, green onion, garlic, and corn. Toss with Cilantro-Lime Vinaigrette. Melt the butter over medium-high heat in a nonstick pan. Add the scallops in batches to avoid overcrowding. Cook, flipping once, until just cooked through, about 1 to 2 minutes per side. On a large shallow platter, place the greens or lettuce. Top with the bean mixture, then place scallops on top. Garnish with additional minced cilantro, if desired.